This article won the LitigationWorld Pick of the Week award. The editors of LitigationWorld, a free weekly email newsletter for litigators and others who work in litigation, give this award to one article every week that they feel is a must-read for this audience. The software adds a Redact tab to the Word and Excel toolbar and also creates a standalone program. Lawyers often have to redact documents in order to obscure confidential, privileged or sensitive information. Redaction is most typically required for documents filed with a court or exchanged during discovery. For PDF documents, redaction is a fairly simple process, because most of the leading PDF programs used by lawyers include redaction as a built-in feature. Both Adobe Acrobat Pro and Nuance Power PDF Advanced include the ability to black out sensitive information. Redaction is not so straightforward in Microsoft Word and Excel. To redact text in these programs, you need a third-party plug-in. For Word 2007 and 2010, a free redaction tool can be downloaded from http://redaction.codeplex.com. The tool was created by a Microsoft engineer, but it is not officially supported by Microsoft. Its functionality in Word is limited and it does not work with Excel. Another popular redaction program, Redact-It, does work with both Word and Excel. However, it does not allow the redactions to be saved in the native Word and Excel formats. Rather, it outputs the redactions to PDF or TIFF files. 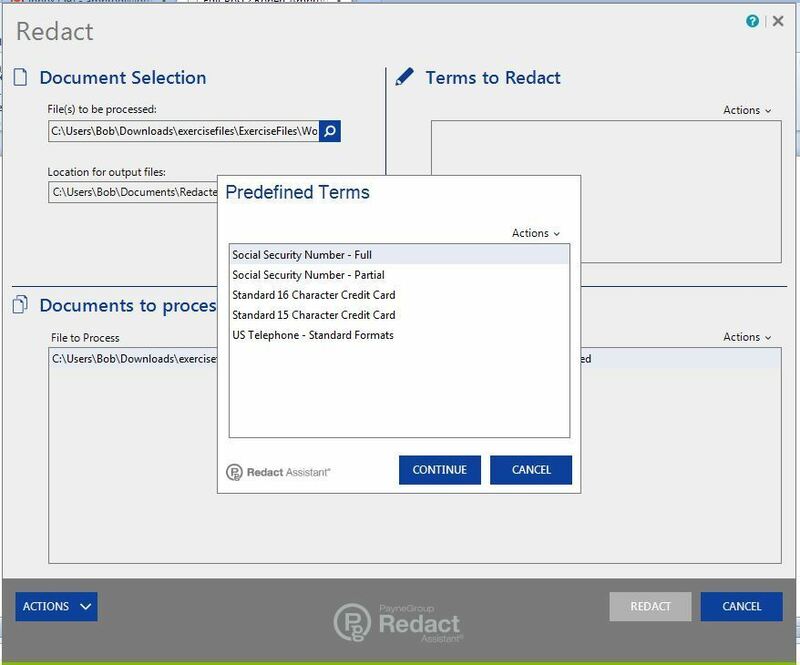 Recently, PayneGroup released Redact Assistant, a new product that makes it easy to redact information in native Word and Excel documents in Office 2013 and 2010. It offers several advanced features, including the ability to redact multiple terms in a single operation and to redact multiple files at the same time. It is the only stand-alone program that saves Excel redactions in Excel format. Donna Payne, CEO of PayneGroup, recently provided me with a brief demonstration of Redact Assistant and then provided me with a free download of the software to test on my own computer. I found the software to be easy to install and easy to use, both for simple redactions and more complex operations. Redact Assistant can be purchased and downloaded from the PayneGroup website (www.thepaynegroup.com) for a price of $45. Quantity discounts are available for purchases of 20 or more licenses. The software works with Word and Excel 2010 and 2013 and can be run on both 32- and 64-bit Windows operating systems, beginning with Windows XP. It does not work with the cloud-based version of Office 365. Once the file is downloaded, it installs in just a matter of minutes. The program is installed on a computer in two versions – as a standalone program and as a plug-in within Word and Excel. The standalone program is using for redacting multiple files at once and for other advanced operations. The plug-in is used to redact a single Word or Excel file. A word of caution: When Redact Assistant redacts, it means it. Even the licensed user of the program cannot reverse a redaction. Once a file is redacted, saved and closed, the redaction is permanent. Even before the file is saved and closed, the “undo” command works for redactions only in Word, not in Excel. That means that you should create copy of the original file before redacting it, so only the copy is redacted and the original is preserved. To redact multiple files in a single operation, you would use the standalone version of Redact Assistant. With the software open, you first select the files to be redacted and then select a file-folder location for the redacted files to be output. The software automatically outputs the redacted documents as new files and saves the originals. The software lets me choose predefined terms to redact and add my own terms. After selected the files, the next step is to identify the terms to redact. You can list multiple words, phrases and patterns to be redacted in a single operation. For example, you can list both “Mrs. Smith” and “Sarah Smith” to redact all instances of both phrases. A useful feature is the ability to select from a list of predefined terms for redaction. 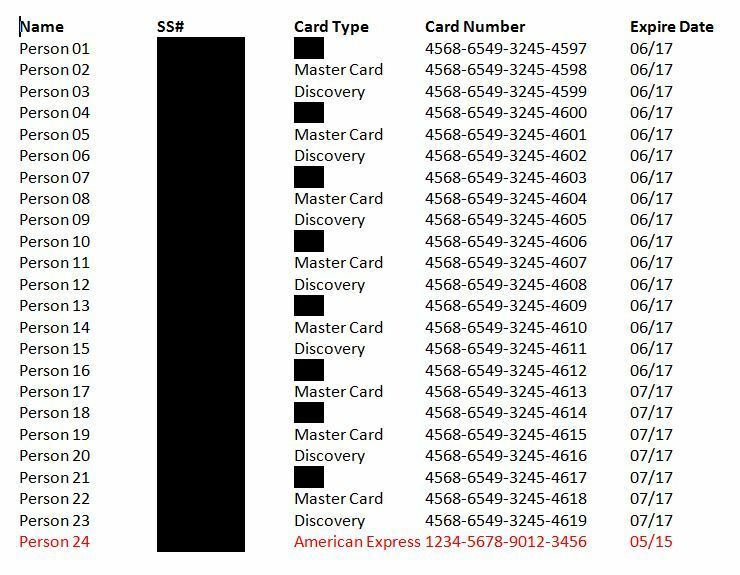 This lets you choose to redact full or partial Social Security numbers, credit-card numbers and U.S. telephone numbers. 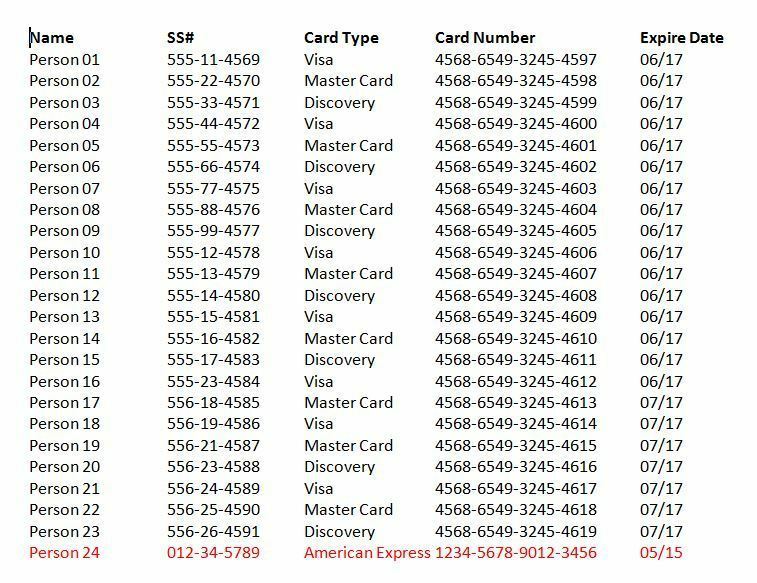 Simply select an option from this list – such as “Social Security Number – Full” – and the program will search all the selected documents for Social Security numbers and redact them. Here, I’ve chosen to redact Social Security numbers from the list of predefined terms and also to redact the name Visa. Another option is to create and save lists of search terms. The lists must be created in the standalone program, but then can be used either in the standalone program or within Word and Excel. To create a list, type the search terms in the dialog box and save it. To use the list, click “Actions > Load Search Terms” and select the desired list. Here is the document before performing the redaction. 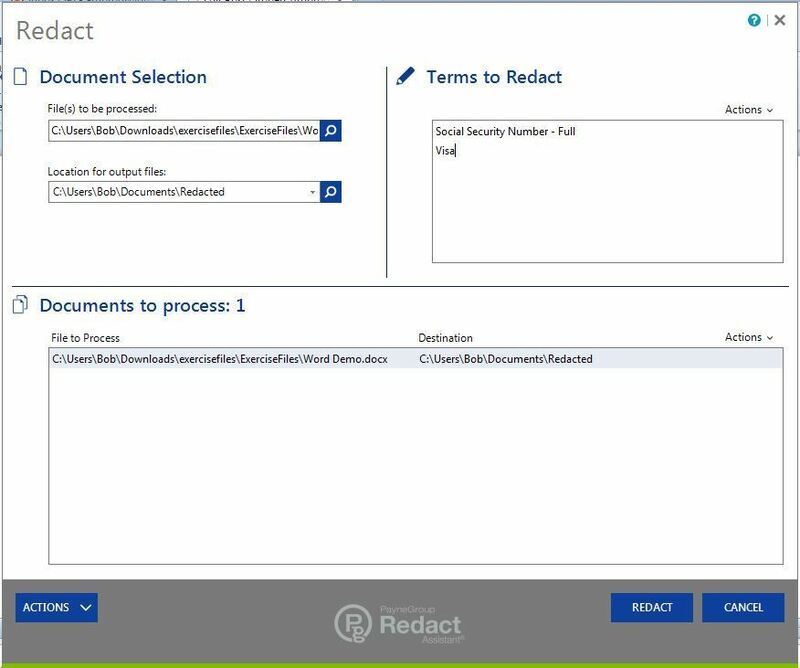 A final option when redacting multiple documents is to set search options for the terms to redact. This lets you select a term or phrase (or multiple terms or phrases) and designate options for searching for the term or phrase. You can this to perform wildcard searches or “sounds like” searches, for example, or to match a specific case or ignore punctuation. Here is the redacted document. Installation of Redact Assistant creates a “Redact” tab in Word and Excel. This is where you find the commands you can use to redact a single file within those programs. As noted above, you will want to create a copy of the original file before making any redactions. With the copy open in Word or Excel, select the text to be redacted and then click “Redact Selection” on the Redact tab. If you make a mistake in Word, you can use the Undo command to reverse the redaction. In Excel, you cannot undo a redaction, so be careful. Once you’ve completed redacting the document, save and close it. At that point, the redactions are permanent. Even you as the author cannot reverse them. However, the document remains in its native Word or Excel format and can be edited and manipulated in all other ways. The reason to buy this program is for its ability to redact Word and Excel files in their native formats. Not every lawyer needs that ability. Often, redacting a document in PDF is sufficient. However, there are a number of situations where it could be useful to have the ability to securely redact native files. One common situation is e-discovery, when you need to produce files in their native formats. With this software, you can safely provide documents with sensitive information securely redacted. Another situation suggested to me by Donna Payne is when you are working with someone – perhaps a client or another lawyer – who you want to have access to a file, but not allow them to see parts of the file that are sensitive. Ideally, most law offices would want multiple redaction tools, so that they have the right tool for the right document at the right time. If you need a tool for redacting Word and Excel files, Redact Assistant does the job well. It is easy to use, it has advanced features for handling multiple documents and searches, and, at $45, it is reasonably priced.